Dr. Knauss with husband, Jake and sons Joel and Connor. Gothenburg Health is excited to welcome Kayla Knauss, D.O., to our team of Hometown Providers. Dr. Knauss starts orientation at Gothenburg Health on December 3rd. 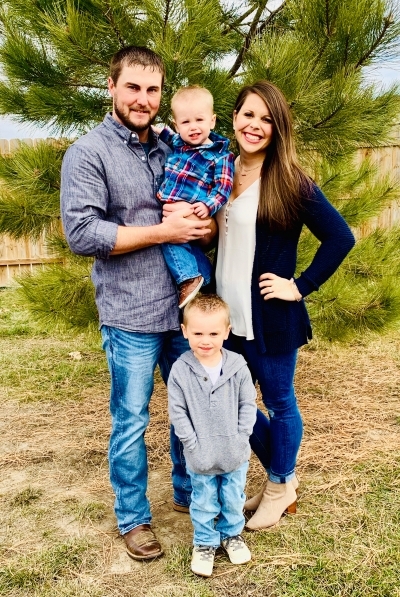 Originally from Dawson County, Dr. Knauss graduated from Cozad High School in 2007 and went on to receive her BS from the University of Nebraska-Lincoln in Biochemistry in 2011 and her D.O. from Rocky Vista University College of Osteopathic Medicine in Parker, Colorado in 2015. Dr. Knauss recently completed her residency at Via Christ Family Medicine in Wichita, Kansas. Dr. Knauss explained that she chose Gothenburg Health because of the people. “From the very first meeting, I was impressed with the friendly and personable staff,” said Dr. Knauss. “They made me feel very welcome. I always wanted to come back to Nebraska after residency because this has always been ‘home’. Gothenburg turned out to be the perfect fit.” Dr. Knauss went on to explain that the community of Gothenburg and the exceptional facilities are two additional factors that make her excited to start practicing at Gothenburg Health. Dr. Knauss and husband, Jake, have two sons, Joel (almost 3) and Connor (1). Jake keeps busy with the family farm and selling Stine seed. The family has a very large yellow lab named Maverick. Dr. Knauss and Jake both grew up in Cozad and currently reside there. In her free time, Dr. Knauss enjoys spending time with family, reading or doing crossword puzzles, skiing, or watching sports. She can also be seen walking or running with her children in the stroller.